Though your pet hermit crab is a land dweller, that doesn't mean he has a set of lungs. All hermit crabs have gills, whether they're aquatic or land hermit crabs, although land hermit crabs have smaller gills than their water-based relatives. Without the proper level of humidity, a hermit crab can suffocate. The hermit crab uses modified gills to provide him with oxygen. His gills are located in his brachial chamber, which -- combined with his gills -- acts like a lung, allowing him to breathe through the air instead of water. To get an idea where his breathing equipment is located, picture your crab's thorax, above his legs. His brachial chamber and lungs are along the side of his thorax. Despite his gills, a land hermit crab can drown. However, he still needs access to water for drinking and bathing. Chlorine-free water in a non-porous, non-metallic container will allow your crab to bathe and drink as he sees fit. The container should be large enough for him to move around in comfortably. For his safety, the water should be changed daily, and he should have an easily accessible area to climb to so he doesn't drown. In addition to drinking and bathing, a hermit crab will go to his water source for shell water. Shell water, carried in the back of the shell, keeps his abdomen and gills moist, ensuring he doesn't suffocate. The crabitat's humidity level also helps his breathing equipment stay moist, so it's important to maintain a proper level of moisture in his home. Proper substrate and use of sponges help keep a safe humidity level, between 70 and 80 percent. Your crabitat should have a hygrometer, or humidity gauge, to monitor humidity levels. Most homes have a humidity level of 40 to 50 percent, much lower than what your crab needs. 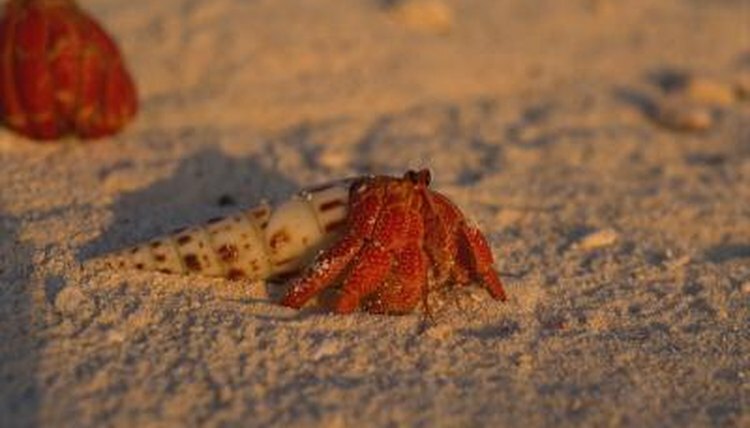 A dry environment will eventually damage the crab's gills; the Hermit Crab Association notes insufficient humidity will cause a crab to slowly suffocate. There's also too much of a good thing; a crabitat above 85 percent humidity will develop fuzzy mold. How Is the Frog's Skin Adapted to Life on the Water?